A Midsummer nights dream, might turn into a nightmare for most young adults under the age of 21, in the province of Ontario. Mcguinty’s Protectionista’s at Queens Park whose greatest concern is new and creative ways to protect you from yourself have the audacity to reintroduce the unfair and unpopular laws concerning young drivers in the province. In the dead of summer our Premier decides to enact a law that might have some merit, yet its implementation stinks, of misleading and under handed dealing. In the modern-day art of issue management the goal is to introduced a unpopular measure when people are simply not paying attention know bellyaching equals no backlash. The smart set in Toronto must be crowing about how they are just about to get another piece of the Liberal agenda over, on the sleepy Ontario public. In Ontario, a tax isn’t really a tax, it is a reallocation of funds, and a reversal isn’t really a reversal, it’s an exit plan. Enough with playing games and trying to manage crises in a time of real problems Ontario needs real leadership. Fool me once, shame on you, fool me twice shame on me. It has become apparent that the Mcguinty government is no friend to the youth in Ontario, as evidenced by increasingly trying to stifle innovation and ambition from the province’s youth. 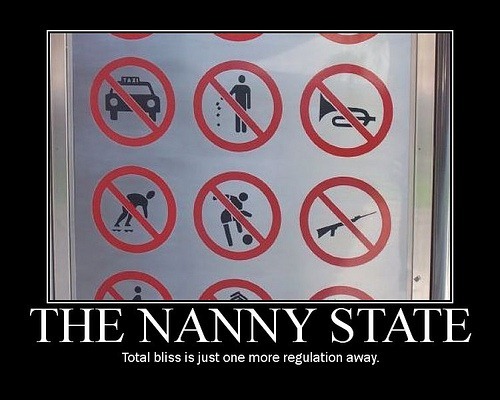 Along with introducing all of these unpopular nanny state regulations, that do no good for no one.